Our blank laser cut place cards are the best addition to your Wedding, Bridal Shower, Baby Shower, Birthday party and more! 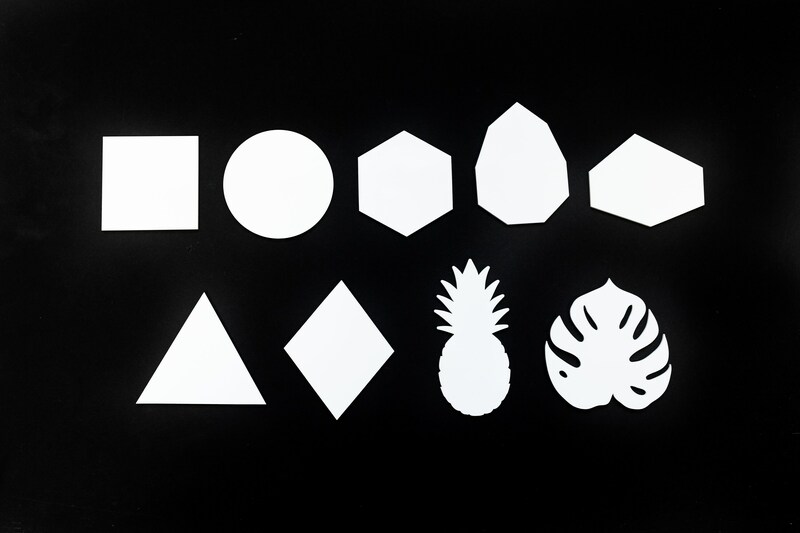 Image is solely to show the variation of shapes. These do not all come in one package. You must select the desired shape. The Monstera, Rhombus, and Gemstone are in separate listings. *** If you would like to have names individually engraved into each place card, please reach out to us for custom orders. Comes in either birch wood or acrylic material options. Use sharpies, ink pens, and/or acrylic paint to write names and decorate. Width = ~2" - 4"
For custom orders, please contact The Roc Shop, LLC. at least 2 weeks in advance. They can be used in photo booths, as home decor, or just for fun. However, they are NOT TOYS. Please do not put into mouth or give to children. Handle with care. Please allow 3-5 days for production of place cards. All artwork is copyright 2019 The Roc Shop LLC. No art or images shall be recreated, used, or sold without the permission of The Roc Shop LLC.